Just a quick note of thanks for the great job Cedarclean did on our cedar roof. Our roof is almost 14 years old and was starting to show sever signs of wear and tear. 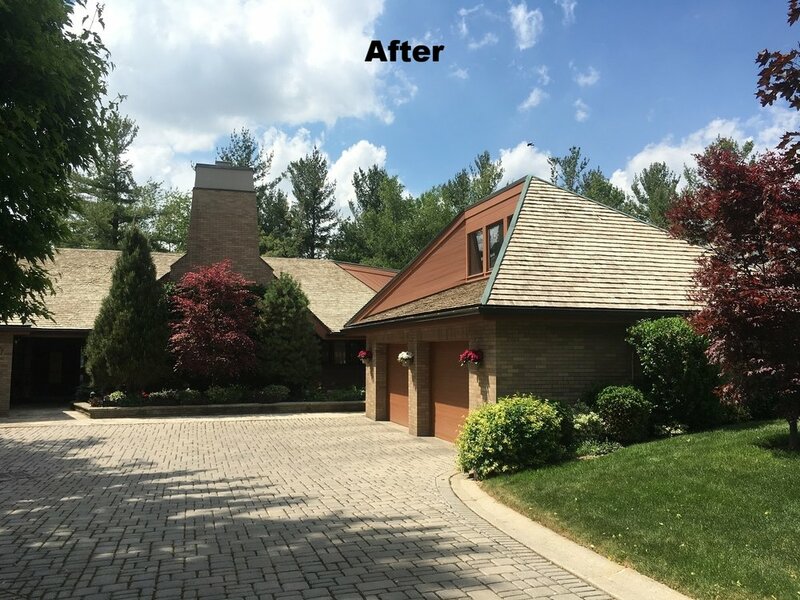 Cedarclean did an outstanding job and through their extensive cleaning and revitalizing process brought our cedar roof back to new condition. The team was efficient and always on time. They took care not to damage the many shrubs and plants which run along the walls of our house. They meticulously covered the plants and shrubs with lightweight sheeting to prevent any damage from the roof run-off. When they were finished all our windows were cleaned and there was absolutely no after-sign of the extensive three days of roof cleaning and renewal. We would have no hesitation in recommending Cedarclean for your home and wish them continued success. “Thanks to CedarClean, our roof looks as good as new [or as close to it as a 17 year old roof can]. Not only did you show up when you said you would, your work was performed in a timely and professional manner. You and your crew took care to protect our grounds and landscaping, and returned our property to us in tip-top shape at the conclusion of your work. I would highly recommend your services to anyone looking to maintain their investment in their cedar roof and home. I wanted to send you a brief note about my experience with your company which I am delighted to have found on line. We have a heritage home with cedar shingles / shakes and I have been looking for a solution to arrest the decline of the integrity of the roofing material for quiet some time. Our cedar shingles / shakes had a lot of moss and build on them and thanks to your excellent service, the roof looks brand new and we have added several more years of life to the cedar shingle and shakes. We have extended the life of our roof with your help. You are prompt, efficient and thorough and I would unreservedly recommend you to anyone looking for a cleaning of their cedar roofs. “Cedar Clean done our cedar roof which is very large. We where very happy with his work, took the time to cover all the greenery and the roof looks just like when was new (almost) on 12 year old cedar roof! "We have a fairly large summer home in Muskoka with a cedar shake roof. The roof is 11 years old and because we have so much shade, it was becoming infested with lichen and moss. I did a lot of research on the safest and best way to clean the roof and decided that I wanted a company that used a soft pressure, environmentally friendly method. I did not want high pressure cleaning as offered by most roof cleaning companies. The only company that I could find to do this was Cedarclean from Grimsby. I spoke to Greg Jones, he carefully explained their process and I decided right then that I wanted him to clean our roof even though he said they were booked well ahead. It was our good luck that a few days after our discussion, Greg called to say they could do the job earlier than expected, we agreed the price and he and Thomas arrived the next day. I hadn't realized how much work it would be to clean the roof but was absolutely delighted with the result. Our roof looks like new. Not only did the outcome exceed our expectations but the clean up and care of our property during the cleaning was absolutely superb. The final unexpected bonus was a complete window washing. We now have crystal clear windows to go with our new looking roof. Greg and Thomas were a pleasure to work with and I highly recommend Cedarclean and Greg Jones for anyone who wants to completely restore their aging cedar roof with the added bonus of very clean windows. would highly recommend you and your company. Please accept our most sincere thanks for the magic you recently performed on our house! Despite the fact that the siding and roof are over 20 years old, your process brought them back to a like-new appearance that has earned nothing but admiration from our friends and neighbours. Equally impressive was your attention to good business practice. You were always punctual. Your crew was friendly, respectful and well-trained. Overall, the quality of the work was outstanding. Mess was minimal and cleanup was prompt and thorough. A final "Thank-you" for everything, Greg. You made our "house cleaning" a most pleasing experience! It was a pleasure to have CedarClean work on the cedar shake roof of our home. Greg and his crew arrived when he said he would, the process did what he said it would do and his fee was what he had quoted me earlier. Overall a great job and our roof looks like new! Thank you for the excellent results with regard to cleaning the exterior of our home. Your competitive price and attention to detail is exactly what every home owner is looking for. The over all result exceeded our expectations, especially with regard to the black spore removal on our asphalt roof. As for the siding, the cleansing reinvigorated the look and feel of our home. The curb appeal has been greatly enhanced ! We thank you for your professional and prompt service.